Dear Mona, How Many Flight Attendants Are Men? John Siefer, 26, right, a furloughed pilot working as a flight attendant for a major airline, offers a passenger her choice of beverages on a flight over Chicago on April 15, 1972. Are there more male flight attendants than there used to be? It depends how far back we go in the history of aviation personnel. See, the latest available numbers from 2012 show there are 25,268 American male flight attendants — that’s three times more than there were in 1980 but a few thousand fewer than there were in 2009. But raw numbers are kind of useless in answering your question because the number of female flight attendants has also risen since 1980 and fallen since 2009. I guess what you’re really interested in is whether the percentage of U.S. flight attendants who are men is higher than it used to be. There are a multitude of reasons why a greater share of all flight attendants are men today — one of them is probably age. 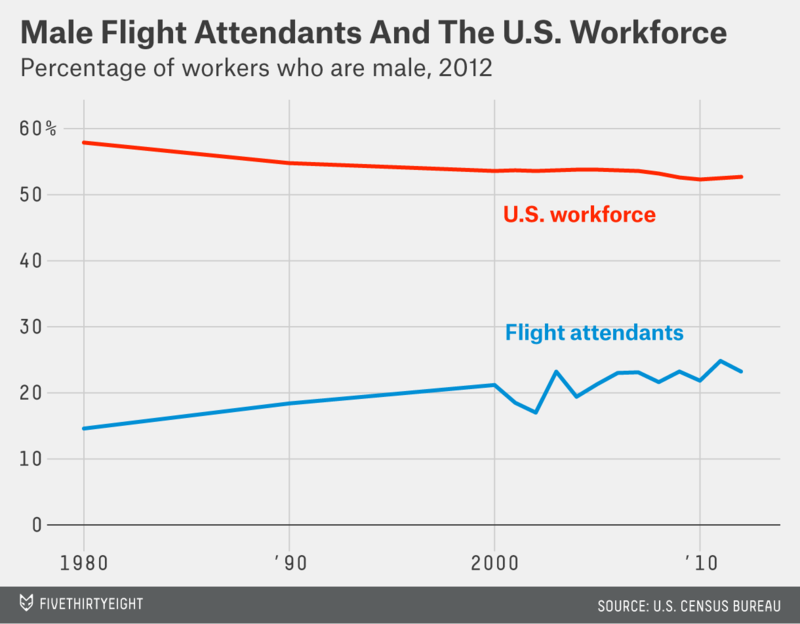 Even in 1980, younger flight attendants were more likely to be men than older ones. So it could be that as men have entered (and presumably stayed in) the cabin crew, over time they’ve gradually increased their overall percentage. Between 1980 and 2007, the median age of all flight attendants rose from 30 to 44. That’s not the only change to have occurred over the past 30 years. As sociologists at Texas A&M University pointed out in 2009, flight attendants as a group have become less white, with black and Hispanic employees making up a bigger share. They cited 1960s civil rights laws that forced airline companies to expand their recruitment preferences as an important reason for the change. And yet, despite those changes in gender, age and race, the people pointing you toward the emergency exits are still relatively homogenous: 58 percent of all U.S. flight attendants are white women. That makes the airline sector slightly peculiar. Once we look at all industries, the same job category of “public transportation attendants and inspectors” is 40.6 percent male (of all races). So, it’s clear that flight attendant demographics are unusual by transport standards, but it’s kind of hard to grasp just how unusual it is that 24 percent of the sector is male without making broader comparisons. To do that, I looked at the gender split of all 320 occupations listed in the Minnesota Population Center’s database. The job category that most resembles flight attendants in terms of its gender split is “interviewers, enumerators and surveyors,” only 24.1 percent of whom are men. Other similar roles are “teachers” (23.9 percent male), “administrative support jobs” (23.4 percent male) and “dressmakers and seamstresses” (24.6 percent male). So, Jack, if you’re intrigued by how many male flight attendants you see, you might also keep a mental tally of the number of male receptionists, hairdressers and typists you encounter, because this data shows those are a much rarer breed of American worker.